This outfit is unlike anything else I have in my closet, but it has quickly become my favorite! I'm always looking to step outside of my comfort zone and try new things, and this leather mini was definitely that. Living in the Carolina's, you learn that fall is all about layering. It's always chilly in the morning, and by the time mid afternoon rolls around you're ready to break a sweat again. 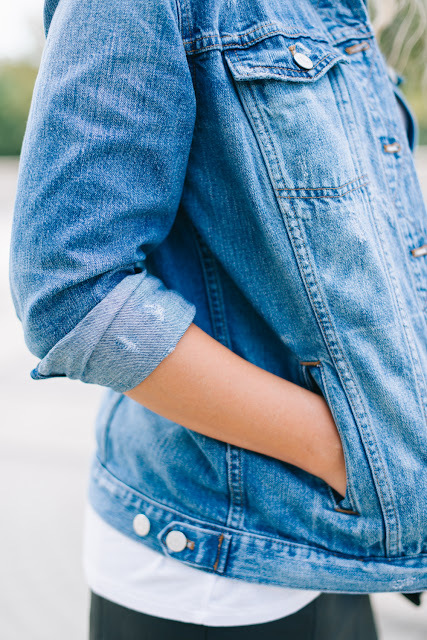 Hence the need for this amazing oversized denim jacket (obsessed). It's the softest denim I have ever felt, and it's just the right amount of "oversized." Not to mention, all three of these pieces can easily be transitioned into other looks. For example, the faux leather mini can be paired with heels and an off the shoulder sweater like this, or this, for an evening look.